Explore "the city of a hundred spires" during this 3,5 hours tour. Admire Prague sights including famous Charles Bridge, Prague Castle, National Museum and Dancing House. Enjoy coffee/tea or soft drink during your boat cruise. This tour will provide you with an overall coverage of the historical sights in „ the city of a hundred spires”. During about 1 hour long coach ride with audio guide you will have an opportunity to see the most important parts of the city – The Municipal House, Wenceslas Square, National Museum, Charles Square, Dancing house, beautiful riverside and more. Bus takes you to the Prague castle area where you will see the beautiful view of Prague. 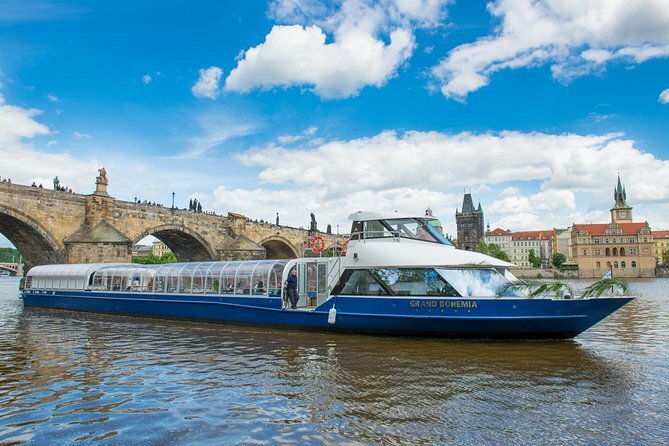 You will continue this tour by walk to the pier where you will enjoy short river cruise on the Vltava river. Coffee/tea or soft drink will be provided. You will explore this beatiful city from another perspective. The boat ride starts and finishes by Charles Bridge and a walking tour of Charles Bridge ensues. The tour terminates at Charles Bridge. The Yellow Kiosk located in the Republic Square opposite the Municipal House (near Powder Gate). The tour terminates at Charles Bridge.